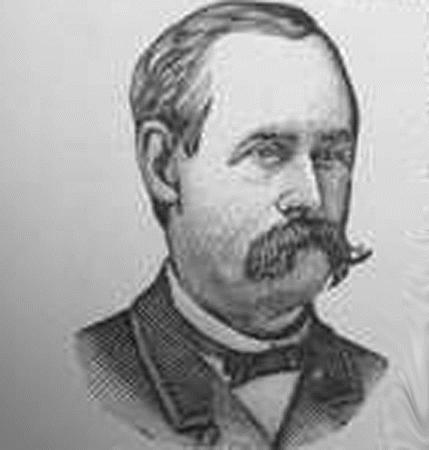 Born Jun 23 18447 [Jun - 18452,3,5], Genesee County, New York7. Edwin Hickox, age 32, born in Connecticut; labroer. Caroline Hickox, age 27, born in New York. Ira Henshaw, age 5, born in New York. George Hickox, age 2, born in New York. Edwin Hicox, age 41, born in Connecticut; $2200 real estate. Caroline Hicox, age 37, born in New York. Ira Henshaw, age 15, born in New York. George Hicox, age 11, born in New York. Mary Hicox, age 9, born in New York. Charley Hicox, age 3, born in New York. Henshaw, Ira, age 25, born in New York; farmer; $3300 real estate; $1240 personal property. Henshaw, Emerette, age 26, born in New York; wife. 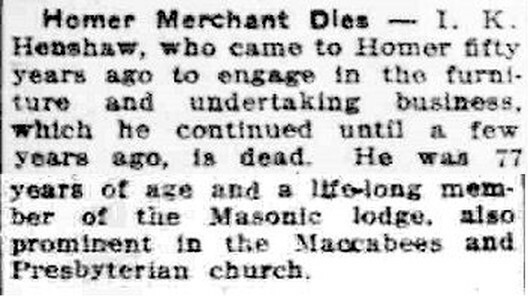 Henshaw, Ira K, age 34, born in New York; parents born in New York; [..occupation unclear..]. Henshaw, Emurette M, wife, age 36, born in New York; parents born in New York; keeping house. Henshaw, Clara B, cozin [sic], age 20, born in Michigan; parents born in New York; housekeeper. Morrison, Sherman, servant, age 22, born in Michigan; parents' birthplaces unknown; gardener. Henshaw, Fany B, adopted, age 10, born in Michigan; parents born in New York; attended school. 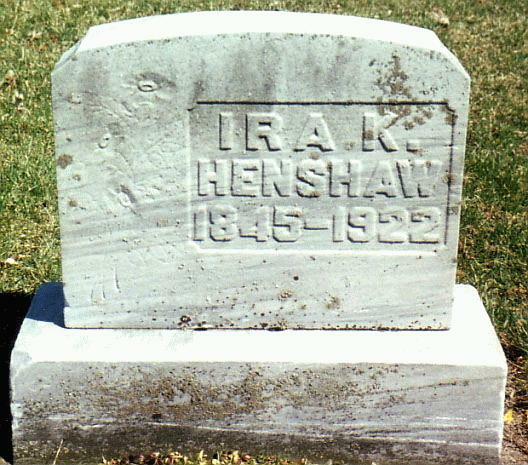 Henshaw, Ira K, head-of-household, age 55, born June 1845 in New York; parents born in New York; married 31 years; occupation: undertaker; owned home (mortgaged). Henshaw, Emerette M, wife, age 56, born June 1844 in New York; parents born in New York; married 31 years; 1 child, 1 living. Henshaw, Iva R, daughter, age 18, born July 1881 in Michigan; parents born in New York. Arthur, Nettie, boarder, age 58, born June 1842 in New York; parents born in New York; widow; 1 child, 1 living; occupation: dressmaker. Harrington, Wm K, head-of-household, age 40, born in Michigan; parents born in Michigan; owned home (free); occupation: janitor, post office. Harrington, Iva, wife, age 30, born in Michigan; parents born in New York. Harrington, Beatrice, daughter, age 18, born in Michigan; parents born in Michigan; attended school. Harrington, Dean, son, age 13, born in Michigan; parents born in Michigan; attended school. 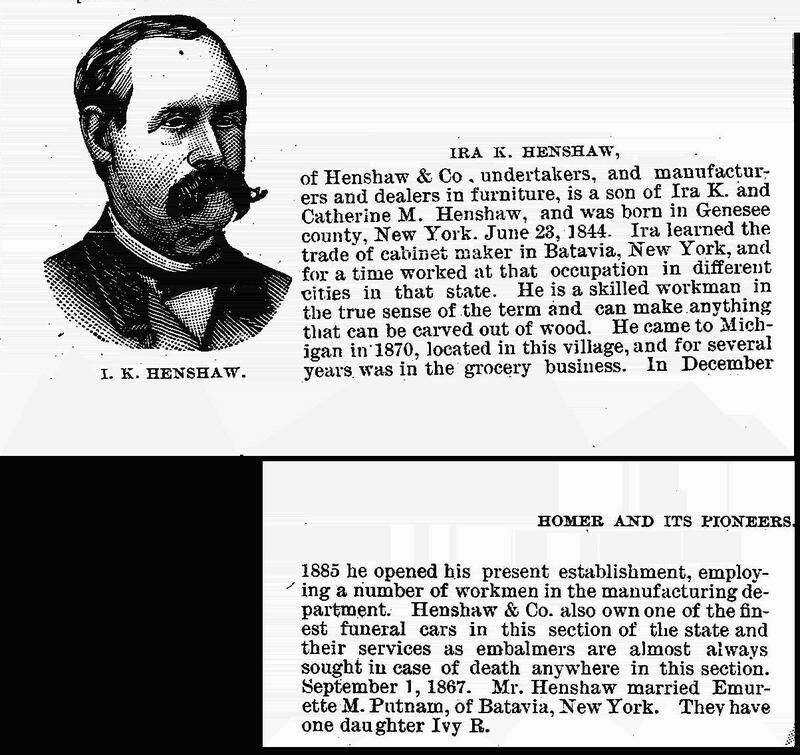 Henshaw, Ira, father-in-law boarder, age 74, born in New York; parents born in New York; occupation: cabinet maker, retired. Henshaw, Emaretta, wife, age 75, born in New York; parents born in New York. Thompkins, Levi, lodger, age 55, born in New York; parents born in New York; widower; occupation: lawyer, [..unclear..]. 1880 census, Homer, Calhoun County, Michigan; roll T9-575, ED 53, page 257D, line #41, dwelling #171, family #174. 1900 census, Homer, Calhoun County, Michigan; roll T623-705, ED 48, page 17B, line #80, dwelling #444, family #446. 1920 census, 4th Ward, Albion, Calhoun County, Michigan; roll T625-759, ED 32, page 1B, line #85, dwelling #23, family #23. "Homer and its Pioneers and its Business Men of To-Day", by William A. Lane; 1888, Homer, Michigan; P.W. Chase, publisher; http://www.ancestry.com. 1850 census, Alexander, Genesee County, New York; roll M432-507, page 145A, line #19, dwelling #146, family #153. 1860 census, Alexander, Genesee County, New York; roll M653-756, page 1028, line #34, dwelling #325, family #558. 1870 census, Alexander, Genesee County, New York; roll M593-939, page 386B, line #37, dwelling #275, family #276. Michigan, Deaths and Burials Index, 1867-1995; http://www.ancestry.com.